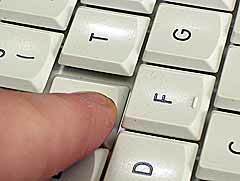 Keyboards can rapidly be covered with mud. But they can keep on for years if one takes carefully care of them and do not use them as a food tray! So, routine: shutdown the machine, unplugged it and remove the battery. 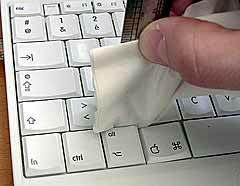 First of all, I summarily clean the keyboard with a slightly wet tissue. 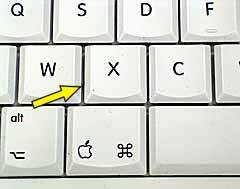 The most annoying dusts are the ones which fall into the interstices between two keys. Stains onto the keys are easier to clean up. One can try to remove the dusts with a piece of padding, but it is not easy. 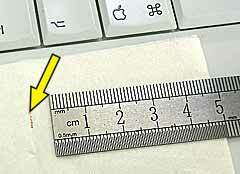 For the horizontal interstices, a fine ruler wrapped between two sheets of a soft tissue (like Kleenex). Do not force and regularly check the tissue to avoid to replace the removed dust by ripped small pieces of the tissue ;-). 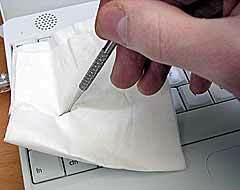 Kleenex tissue opened: the captured dust! Ideally, it is advisory to use such a tool as shown on the image... of course, still wrapped between two sheets of tissues. 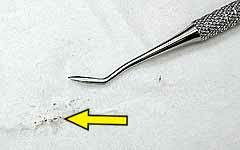 Yellow arrow points to the removed dust. The tool is a king of burnisher, the nail of which has the ideal design in my opinion. 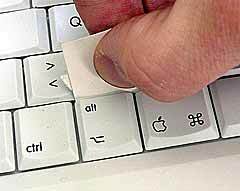 ... and with the other one we slightly push the tool under the dusty key. Be carefull no to unhook the key itself. One can also use a small piece of carboard. 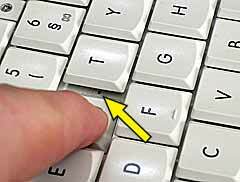 To obtain a perfectly cleaned keyboard, one has to unhook all the keys, like here in a delicate operation. But too complicated operation for a regular based cleaning process. -> Personnaly, I'm satisified with the method above.